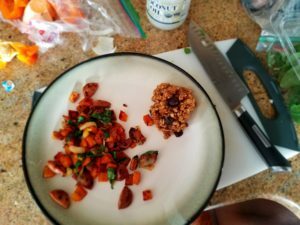 In this post, I have documented the meals I made each day and my thoughts on the recipes I had for Week 2. 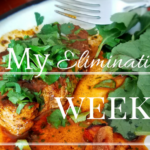 (You can read my post My Elimination Diet for more info.) You can also review my thoughts on Week 1 if you missed it! Week 2 was better for us both physically and mentally. 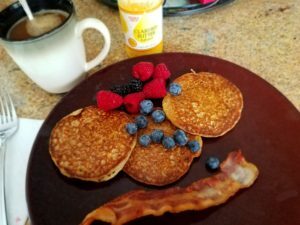 My husband’s bronchitis was beginning to alleviate and we were having a few regular nights of sleep. 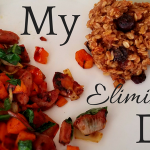 I felt like I could actually start to get a handle on how the diet was affecting me. I started to realize near the end of the week that I hadn’t had any migraines and only one slight headache. My skin was relatively clear too. 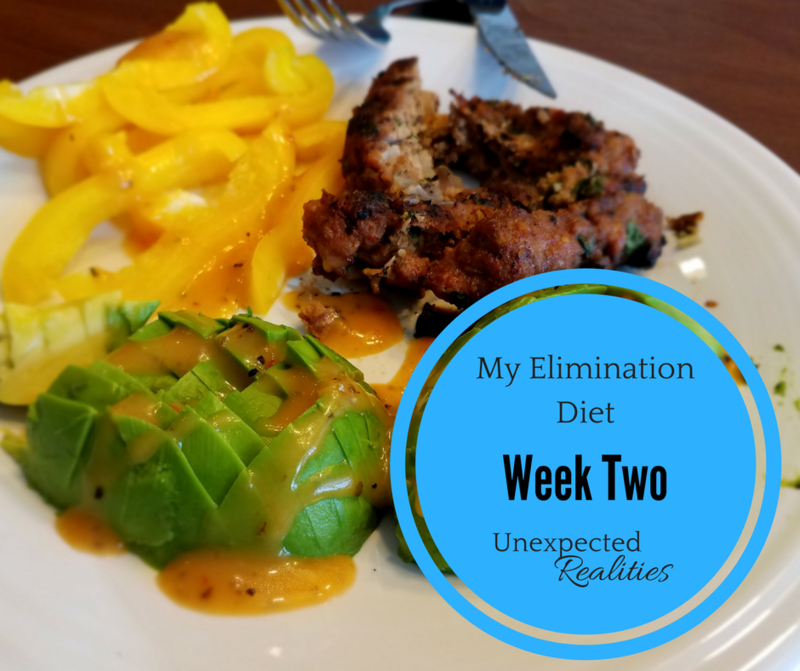 I thought by the second week that I would start to feel cravings from being on a strict diet, but I still didn’t feel particularly deprived. Making lots of delicious food helped! My husband was still dealing with some pretty severe bronchitis, so I tried to make as many spicy recipes as possible to help him get through it. 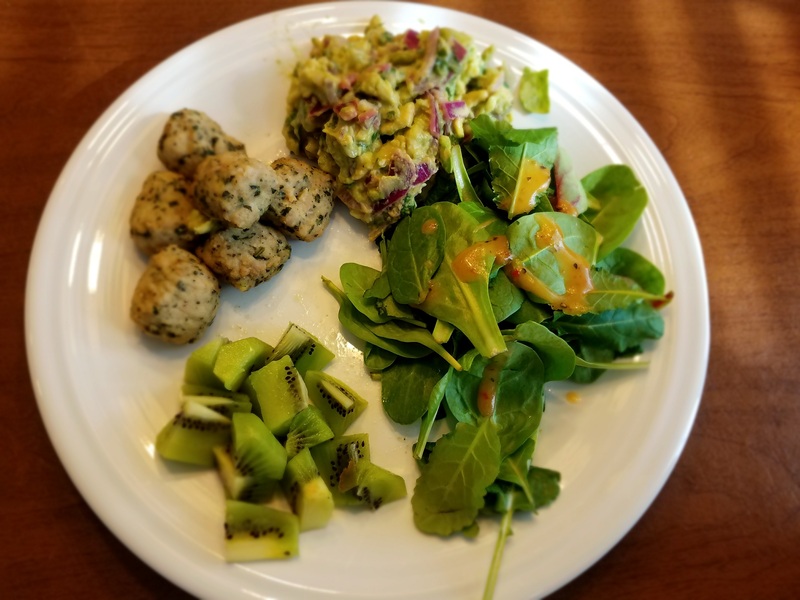 Here’s the meals I had for Week 2! My thoughts: These pancakes turned the best of the ones I had tried. 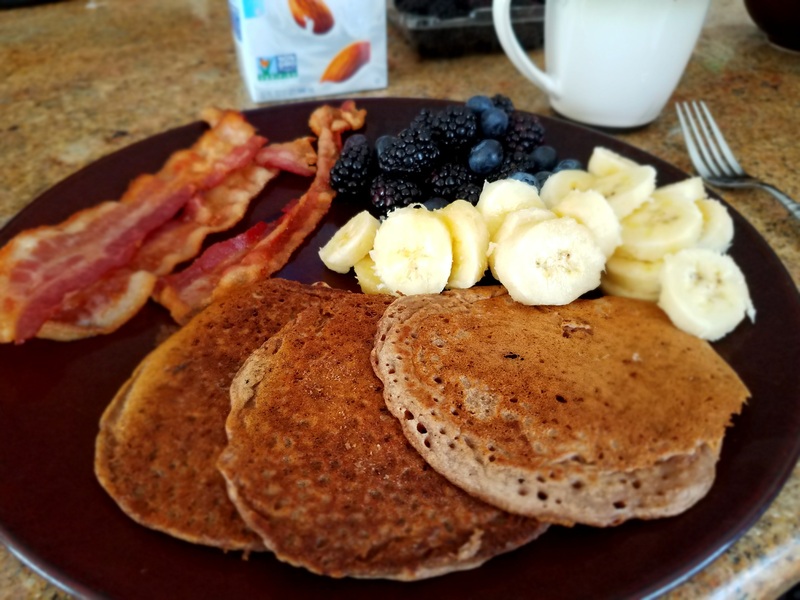 They use gluten free flour (I scored a big bag of Bob’s Red Mill GF flour at Costco). I used unsweetened applesauce and a little bit of flaxmeal and some cinnamon which gave them an apple cinnamon pancake vibe. My thoughts: Winner! This was a great recipe. 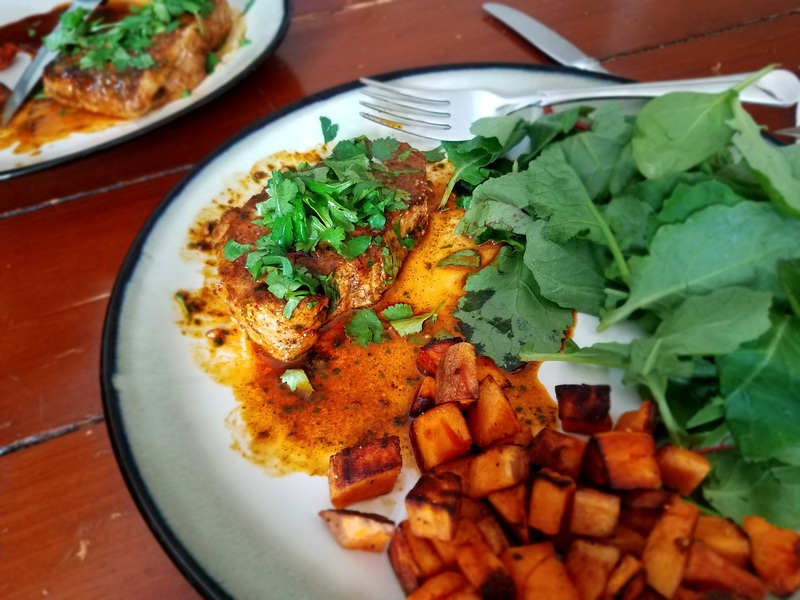 One of our favorite recipes to make is The Pioneer Woman’s Butter Chicken, which contains a load of butter and cream….so that was obviously off the menu. This was a good lightened-up alternative that still had a slightly creamy texture from the coconut milk and was easy to make in the crock pot. You just whisk up the sauce ingredients together on the stove top for a few minutes and then pour over the chicken and let it cook. My thoughts: I loved the combo of flavors in this skillet. 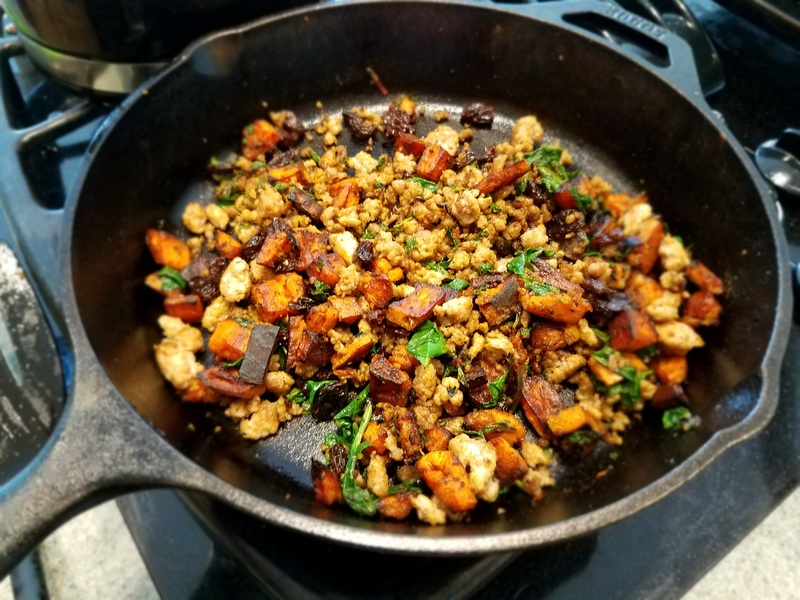 It contains ground pork, sweet potatoes, raisins, and chard, and has a unique touch of seasonings of turmeric, apple cider vinegar, and cinnamon. I have made this several more times since my diet. It’s great to make when you feel like changing up your breakfast routine. 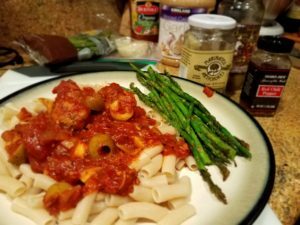 My thoughts: I was by myself on this evening, so I decided to make one of my favorites in a way that I could still eat it on my elimination diet: pasta and meatballs! To start, I chop up some onion and throw it in a pan with some garlic and olive oil, and after a couple of minutes I put in the chicken meatballs (I get them from Costco), and let them get a little browned on the outside. While that’s cooking I chop up artichoke hearts and green olives, and throw those into the pan along with the basil marinara sauce (I like to use brands that do not have any added sugar). I get my brown rice pasta from Trader Joes. It isn’t the same as regular pasta of course, but I have gotten used to it and enjoy it almost as much…probably too much. For a side I broiled some asparagus that I had tossed in olive oil and salt and pepper. It hit the spot! 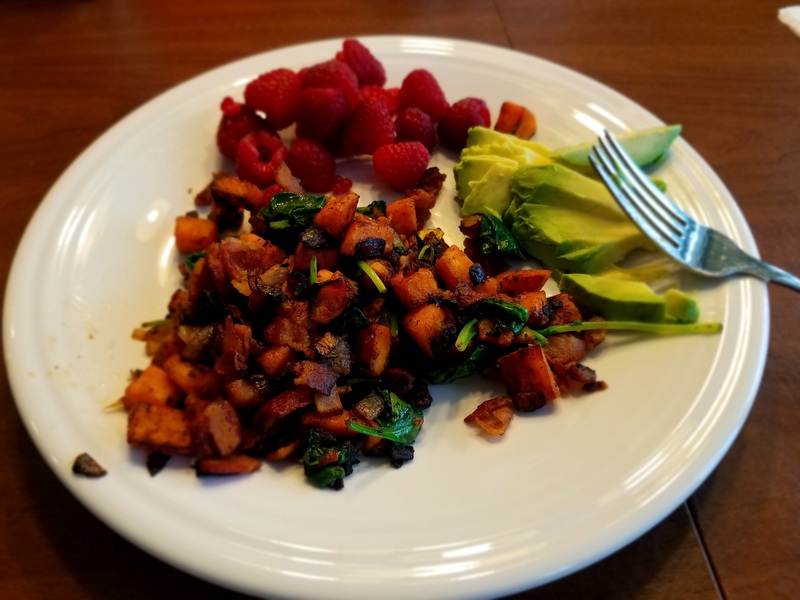 My thoughts: This hash has become a breakfast staple. It’s easy, fast, and I always have the ingredients on hand. 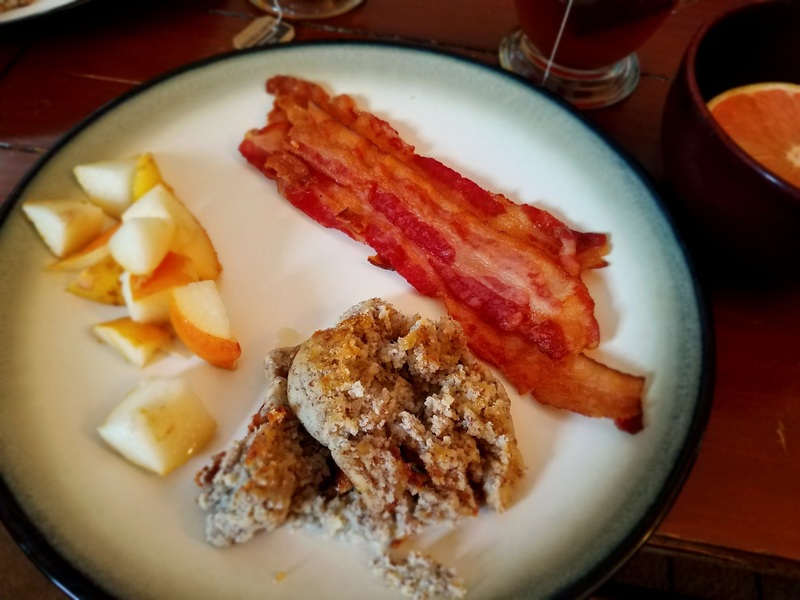 The breakfast cookies were a new recipe for me, but I knew I would like them because I am a big fan of Sally’s Baking Addiction and have made several of her recipes. 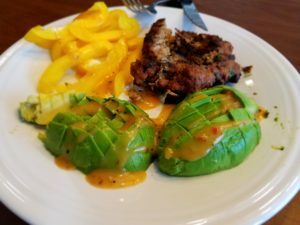 They were easy to make and a good pairing to go along with the savory skillet. 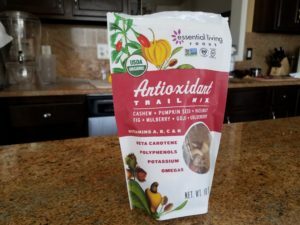 It was so convenient to have these on hand the rest of the week for breakfasts and for snacks. My thoughts: Took my MIL out for lunch for her birthday. We chose a restaurant where I knew I would be able to find something on the menu, and the salmon salad fit the bill. But the reason I avoided going out to eat during this diet is because there is still usually something I have to ask to be removed, which is disappointing. Why does every salad have to tempt me by having cheese on it? 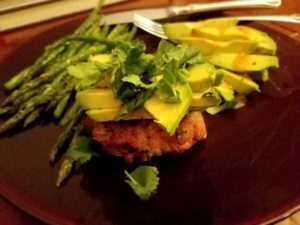 My thoughts: I was not ecstatic about how these burgers turned out. I do want to give them another try, but I think they need something added to help keep the meat moist. Plus my hubby overcooked them which aided to them being dried out, but we will forgive him for that. Paired with sliced avocado and roasted asparagus. My thoughts: These burgers weren’t quite as good leftover. I think adding something to keep the moisture as I said above would help. I did have a perfectly ripened avocado, though, which made lunch great again. Drizzled with my go-to dressing, Simply Balanced Italian. 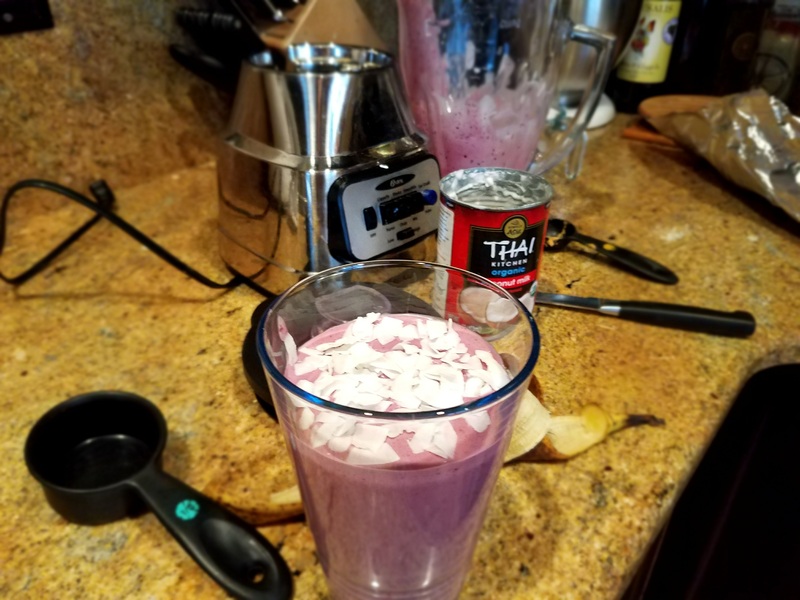 My thoughts: This recipe was ok, but not great. 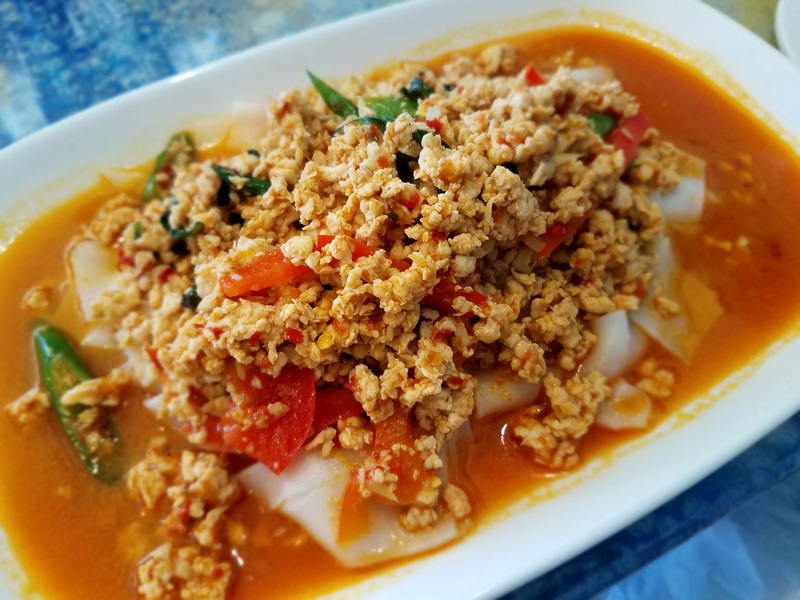 The flavors were not bad but it had too much coconut milk which made it too thick. I should have thinned it out with some broth. 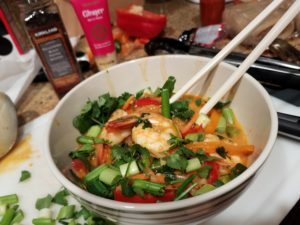 I think I will stick to my version of coconut curry soup and just substitute shrimp instead of chicken next time I have a craving. My thoughts: Wasn’t a huge fan of these pancakes. Substituted the whole wheat flour for GF flour and soy milk for vanilla almond milk to make it compliant. They won’t be making it into the rotation. Had my first coffee of the week! My thoughts: We were out most of the day and it turned into a snacking day! I had hummus with roasted pine nuts and corn tortilla chips at home, along with a sliced up avocado drizzled with Simply Balanced italian dressing. Took my bag of trail mix in the car too to keep me from starving – I got it at Costco and it helps keep hunger away with nuts, seeds, figs, and berries. Dinner: Dinner with family! We had grilled pork, potatoes, and salad. 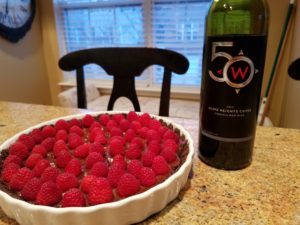 For dessert, I made this No-Bake Raspberry Chocolate Tart. My thoughts: Oh my! I can’t tell you how happy I was to find a delicious dessert that I could have on my diet. 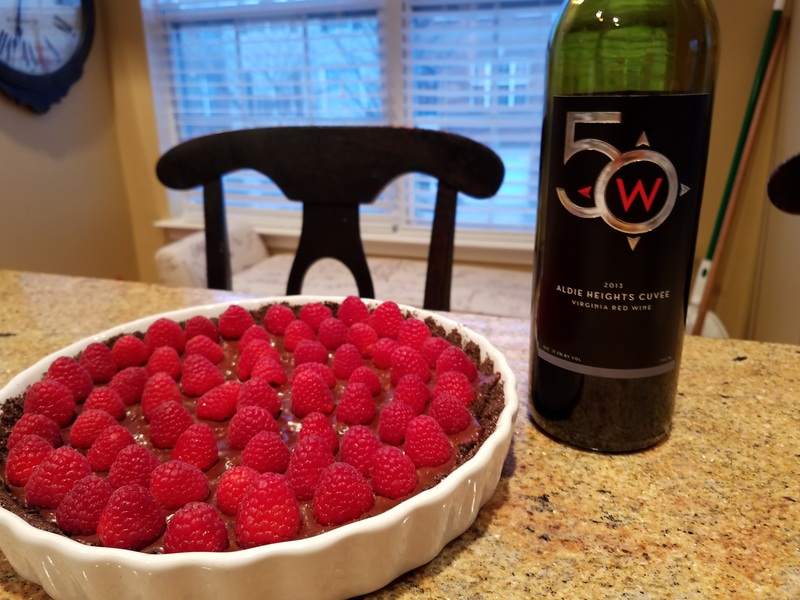 It was just a tad sweet and the raspberries went along perfect with the dark chocolate. The first time I made it here I was in a hurry and I somehow left out the coconut oil in the crust. It was still good but the crust was very crumbly since it had nothing to hold it together. I have since made it two more times and it is delicious and holds up much better with the coconut oil! 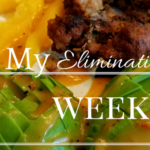 My thoughts: I hadn’t experimented with smoothies yet on the diet, and this was a good one to start with since it was quick to put together on a Sunday morning. I had a bag of mixed frozen berries from Trader Joes that I used and I was all out of almond butter so I used cashew butter instead. 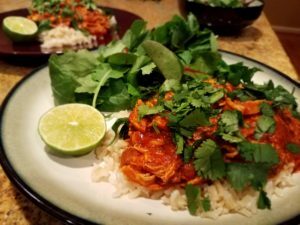 The coconut flakes helped out to give it a textured crunch. 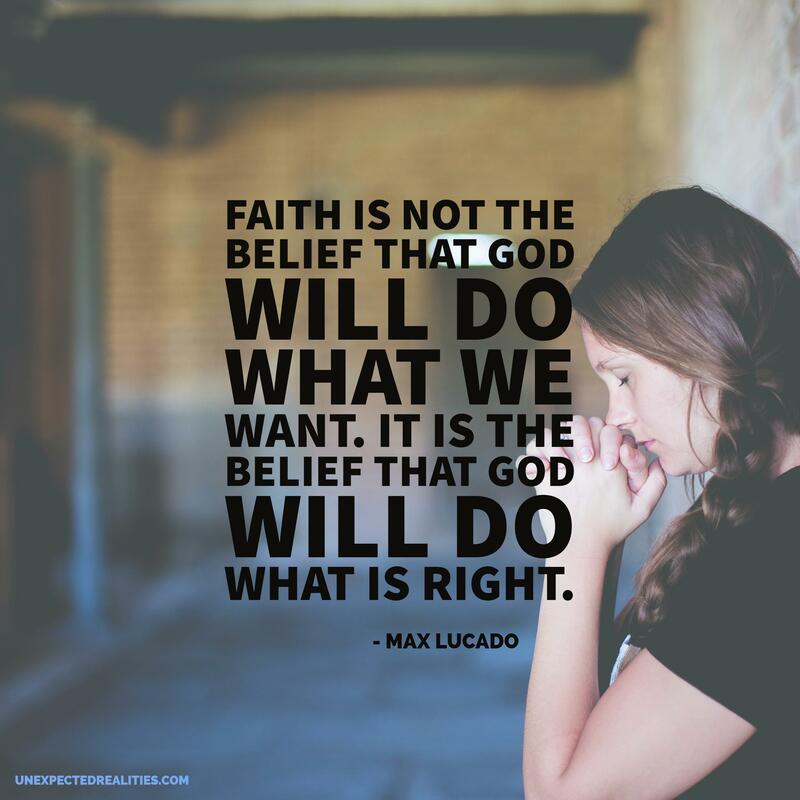 My thoughts: I attended a women’s church event this day and was happy to discover that there were a few things being offered that I could have: a dairy-free pumpkin soup with pepita seeds, a vegetable tray, and corn tortilla chips and salsa. I couldn’t have any of the desserts but I made myself a cup of tea with honey to try to make myself feel better about it. My thoughts: No recipe for this, as it was something I threw together to use some of the veggies that needed to be eaten in our fridge: broccoli, matchstick carrots, and peppers. 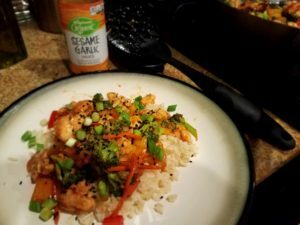 Cooked it with sliced chicken and my new favorite Asian sauce from Wegmans, the organic Sesame Garlic sauce. Added some extra chili garlic sauce for spicyness and topped it with sesame seeds and green onions. It was delicious and made great leftovers. 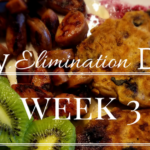 Thoughts and recipes for Week 3 are up!